Defying threats of terrorism, the American University of Afghanistan this week re-opened its gates in the war-riddled capital Kabul after months of closure due to a brazen militant attack last year. 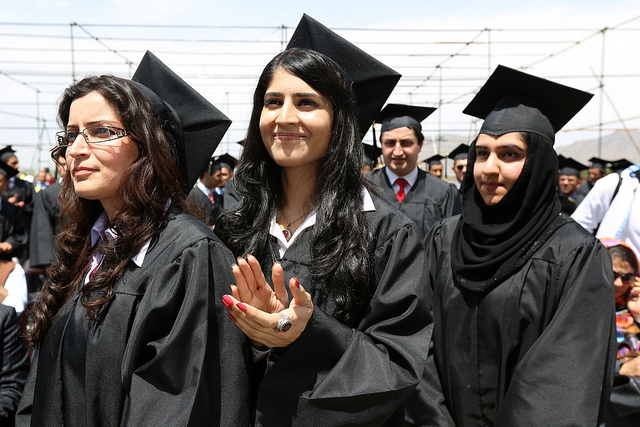 This one-of-a-kind university in Afghanistan has made its mark over the years in educating and grooming a new generation of leaders in various fields. Fate of hundreds of students was in limbo as the varsity – one of the leading high-education facility in region, remained close for more than seven months. Students in the land-locked country have long remained away from modern studies, and opportunities for them to seek higher education abroad are still quite slim. In August last year, four Taliban militants stormed the compound located on a busy street in the western part of the Afghan capital. The deadly 10-hour assault ended early on Thursday August 24, leaving at least 13 people dead, including 7 young students. Despite being purely an academic institution, the AUAF has been on the militants’ hit list merely for its association with the U.S. Two faculty members of this university American Kevin King and Australian Tim Weeks, who were abducted last year, remain in the custody of the Taliban. The AUAF administration has been forced to acquire the services of a foreign security firm among other measures to evade any potential terrorist attack from barring the Afghans seek knowledge and wisdom. One of AUAF’s student Rahmatullah Amiri’s return to the campus signified the resilience of the Afghans in the wake of decades’ old unrest in the country. He received three bullets during the deadly assault on the campus last year. “We will never give-up on our quest for knowledge”, he said on the occasion. All factions involved in the Afghan conflict must realize they have to adhere to the law of the land as well as the human values to be accepted as a legitimate force in any future set-up. Attacks on academic institutions are no less than a war crime, and there should be no impunity for those involved in such blatant acts of terror.